On day 2 of Niconico Chokaigi 2, Yamaha held an hour-long panel talking about their latest VOCALOID-related developments. 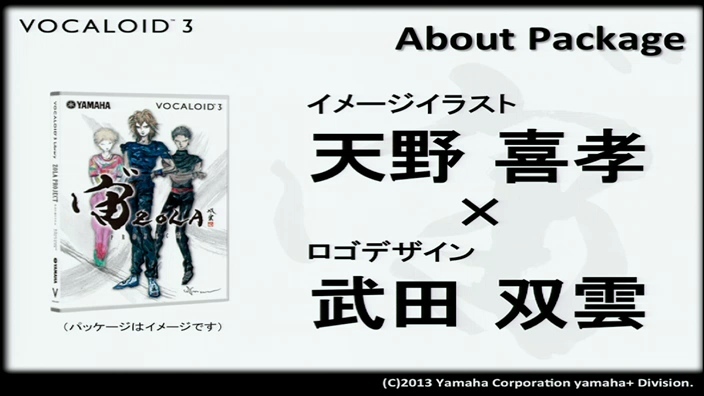 Front and center was ZOLA Project; more background was given about this three-person male VOCALOID sound bank, and voice samples were played as well. Other products featured were DAW plugin VOCALOID Editor for Cubase, VOCALOID3 Job Plugin VocaListener and a series of iVOCALOID iOS apps. Finally, the panel talked about the future of galaco, and PeperonP came up to plug his book. The panel, held on April 28, started off with the trio of voices from ZOLA Project covering “CHA-LA HEAD-CHA-LA”, the opening theme to Dragonball Z as cardboard cutouts of their full-color character “image illustrations” adorned the panel stage. For the first segment, Yamaha’s Yuki Seto took the stage and talked about ZOLA Project, Yamaha’s latest 3-person male voice bank for VOCALOID3. According to Seto, the music just played was created using a beta version of the ZOLA sound bank, which is estimated to be 80% complete in terms of development. He then mentioned the press release that went out recently about ZOLA Project. The idea of creating a sound bank where multiple singers naturally fit together began back in 2007, and now it has finally come to fruition. The press release indicated a release in late June, and the product will come with a Job Plugin for VOCALOID3 Editor that allows beginners and experts alike to easily create backing vocals and unison voices. At the panel, Seto mentioned three main features of ZOLA: 1) creating songs that haven’t been possible until now, 2) highest audio quality due to thorough quality checking and 3) ease of use for both beginners and experts alike. Backing his first point, Seto stated that this was the first time a compound sound bank consisting of three male singers was released, and that since the sound bank supported trios, duets, backing harmony and unison out of the box, there are now more ways to enjoy making music. Furthermore, the “image illustrations” by Yoshitaka Amano (character designer for the Final Fantasy series of role-playing games) were aimed at expanding the fan base beyond the current segment of listeners, creating a new image for VOCALOID. Regarding his second point on audio quality, Seto outlined the process for the creation of the sound bank. Previous sound banks were created by first picking a person and then recording his or her voice. However, this was no guarantee that the person’s voice would be suitable for VOCALOID. Keeping this in mind, Yamaha started with a total of forty candidates in their teens and twenties, and recorded temporary sound banks for all of them to test the sound quality before deciding on who the final three people would be. For these three people, Yamaha then made them undergo over a half-year’s worth of “training” in practicing to read the “incantations” from which the phonemes could be extracted. Seto noted that this was because these incantations were very different from what would normally be on a dialogue script, and that after training, the voicers would be able to essentially recite the whole thing. Finally, the staff at the Yamaha Research and Development Center worked together to put the data together into a sound bank. For the final point, Seto pointed out several features of the product that made it easy for both beginners and experts to use the sound bank. First, it comes with a Job Plugin that makes it really easy to make vocal data for groups of singers. Second, the sound bank is said to sound good even without tuning, although further tuning can make it sound even better. Lastly, the software package comes with a how-to booklet as well as tutorial videos. After summarizing the strong points of ZOLA Project, Seto then showed an illustration of what the box art would look like, stressing that Amano’s artwork of the three vocalists are “image illustrations” and not “character designs”. (i.e. the artwork is like concept art, trying to convey a specific image instead of a specific character design) Logo design is credited to Souun Takeda. Demo songs are expected in June, and they are to be composed by Daisuke Asakura (a profilic composer who has produced albums for famous acts such as T.M.Revolution) with lyrics by Yukinojo Mori (lyricist for CHA-LA HEAD-CHA-LA and also a prolific composer). After the press release, Seto mentioned that they received many questions regarding the product, and he proceeded to answer a few of the common ones during the panel. First was a question regarding how far creative works can go with ZOLA, and the answer was that as long as use was noncommercial or doujin-level, illustrations in addition to of course music were allowed. A specific set of guidelines is expected to published soon regarding this matter. Apparently, Amano had said that the concept art is just concept art, and that final character designs are to be a collaborative creation between him and all the illustrators who end up drawing ZOLA, much like how VOCALOID songs operate. One question wondered about the image being projected for this sound bank being so different from others before, and Seto mentioned that later upcoming announcements are aimed at not just potential new fans but also current fans as well. Another question wondered about the pricing, since the product involved a lot of famous artists and it came with three voices, and the response was that Yamaha would like to release it in a form easily accessible for many. The last question that came up was basically people asking about what the library would sound like. In response, Seto played three segments of just the voice bank singing, one for each of the trio, and concluded the ZOLA Project segment with another beta demo song, “Omoide ga Ippai”, the ending song to animated television series Miyuki. The second part of the panel, focusing on the latest VOCALOID technologies, was a talk event hosted by MCs Asami Tano (seiyuu for Cure Sunny from Smile PreCure!) and fashion model Kyohei Sano. Invited on stage were AIST’s (creators of VocaListener) Masataka Goto and Tomoyasu Nakano, Keio Research Institute at SFC’s Senior Visiting Researcher Ryotaro Mihara, BANDAI NAMCO Composer (including for The IDOLM@STER) Hiroshi Okubo, “father of VOCALOID” Hideki Kenmochi and Yamaha’s Ogasawara. Ogasawara started by talking about VOCALOID Editor for Cubase, or “VocaCu” for short. It was released in January of this year and apparently many producers have latched onto the product. To start, Ogasawara pointed out that up until now, many producers have had this round-about way of producing music with VOCALOID, where for example an instrumental was created in a DAW, and then this was used to create a VOCALOID track in the standalone editor before being imported back into the DAW, with many possible iterations at times. The idea of VocaCu was then to create seamless integration between Cubase, a DAW, and the VOCALOID editing system. He demonstrated VocaCu by first having an instrumental project loaded up and then dragging the temporary melody line from a synth device onto VOCALOID, and then inputting lyrics into VocaCu, allowing the sound bank to sing in time with the accompaniment. At this point, the VocaListener team chimed in, hoping that in the future, VocaCu can support VocaListener directly without having to attach it in a roundabout fashion. Kenmochi then mentioned that for people balking at the pricing for the full version of Cubase, VocaCu is usable with the mid-range Cubase Artist product as well. He also pointed out a Mac laptop on the table, showing VocaCu running on Mac as well. Next up was a segment on VocaListener, which opened with Goto playing a video of Hatsune Miku singing “PROLOGUE” using VocaListener that was uploaded exactly five years ago in 2008, along with the comments at the time. Nakano then explained in more detail how VocaListener worked and played a sample clip where a segment of enka singing was reproduced by Kagamine Rin and Gakpoid. He also stated that different sound banks behaved differently, and therefore a feedback iterative process was needed for the software to “learn” how to sing something correctly for each sound bank. Lastly, in celebration of the fifth anniversary of the original upload, the VocaListener team uploaded 24 new videos of various VOCALOID sound banks with the help of the retail version of VocaListener singing Tairyo Bune, which was originally an enka song from the research-oriented Real World Computing Music Database. Finally, the panel moved on to iVOCALOID, a series of iOS apps aimed for the novice, allowing them to quickly and easily get VOCALOID to sing a song. The Yamaha team demonstrated the app by using touch input to create a melody, which automatically followed previously inputted lyrics. Vibrato amount, pitch and dynamics were also controlled by further parameter tweaking, and the sound came automatically with reverb. The panel closed with impressions from the panelists, and one question that came up was whether these products supported English (and thus would be able to expand overseas). Kenmochi said that although iVOCALOID didn’t support English, both VocaCu and VOCALOID3 Editor supported the language. Okubo mentioned that usually he’d have to sit at a desk making songs, like for IDOLM@STER, but now he’s a bit worried since with iVOCALOID, he’d have to start working while on the train as well. The final segment saw the return of Seto to talk about galaco. He first mentioned that galaco will be usable until October 31, and the usage period will no longer be extended past that. Current users who have not yet received a code that lasts until October 31 are asked to visit the VOCALOID website for instructions to email Yamaha (in Japanese) about getting the final code (before the end of June) by including their current code. He also mentioned that they’ve received a lot of comments asking about the future of galaco, with many upset at the decision and some wishing for a retail release. The official response is that Yamaha is unable to continue to offer galaco the way it is right now and are unable to offer an non-expiring serial code either. However, the project team is currently looking into continuing the project in some other form and asking all users to make sure to ask for the final extension before the June 30 deadline. They promise to make some announcement about their current ongoing activities before the final October 31 expiration date. Lastly, before closing, PeperonP was invited on stage to advertise his book that delves into how to tune VOCALOID and an autograph session for people who bought his book. I’m glad those are only concepts designs for Zola. Vocaloid doesn’t need more effeminate male characters in my opinion!